what does it take to make this application run back on WebLogic? So i'd prefer all-stage-development in JDeveloper, then final deployment to Glassfish. I followed to Shay Shmeltser blog's recommendation on deployement to Glasssfish and reversed it. This error means Data Source is not defined on on your server, you must configure it. i have an application running in weblogic with shared libraries. From JDev i deploy those as shared libraries. 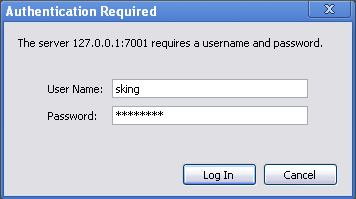 Is it possible in Glassfish? I will need to test this. 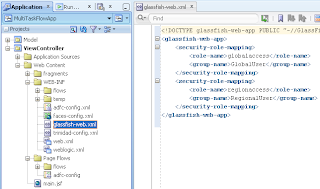 Andrejus did you test the shared libraries in Glassfish? when I login using Glassfish server in first time, the login page appear but when i want to login with another user i refresh the page but the login window did not appear! 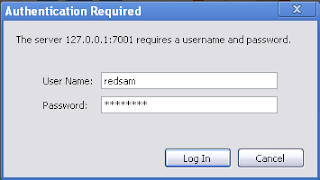 how can i login with another user? about the security in ADF Essentials. We have a non functional requirement to restrict access for users not only to some page or region but also to the records of the table. 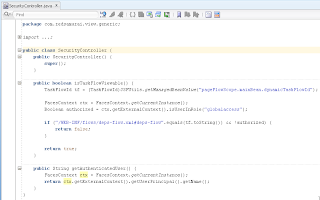 For that reason we use Oracle database context solution, the context is set depending by the user, which is logged in. We use another framework, but are thinking about migration to ADF. What solution do You suggest to use in ADF for solving restriction by records question? Don't You recommend to write own security module for Essentials? 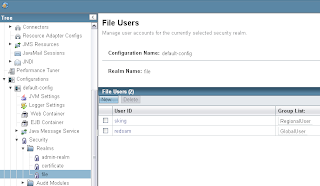 If You keep and manage users and roles in the glassfish server, every time administrator wants to manage security rights, he has to do it in glassfish console which is not so convenient than to do it directly in the application. In some other frameworks (i.e. 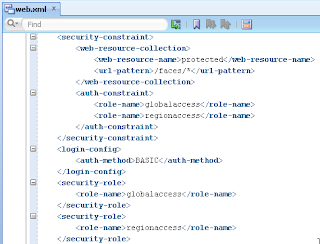 Oracle Forms) we have own security modules, where You can administrate users, roles, functions that can be executed bu role, etc. Application administrator can manage them directly in the application. What would be Your recommendation: write own security module or use some other, for example, to use user and roles administration in Glassfish like in Your example? There are two things - enforce security and manager users/roles. Here I describe how to enforce security. 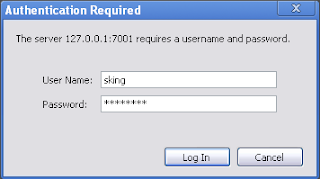 Users and roles can be stored in DB, then you need to define SQL Authenticator. Users/Roles can be managed then in similar way as it is done in Forms. But I was wondering if i am suppose to give anonymous access to a page say login .. how can i define these? because i would like to use form based authentication. Yes, if you want to define login page, it must be granted with anonymous access. 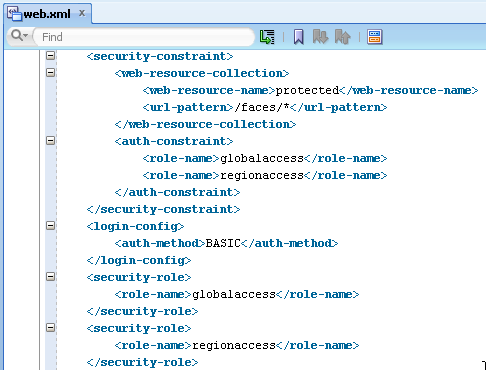 You can define new security constrain in web.xml. Do you know what is the Glassfish equivalent of the Java code to authenticate against the container? I would like to implement an additional login form in the template header of my web app's pages - and such a login is only possible in ADF by doing the login programmatically in a backing bean method. Can this even be done with Glassfish? There is an API called ProgrammaticLogin - but I'm not convinced that's what I need to work with. I have a page where I have buttons Create, Update and Delete. 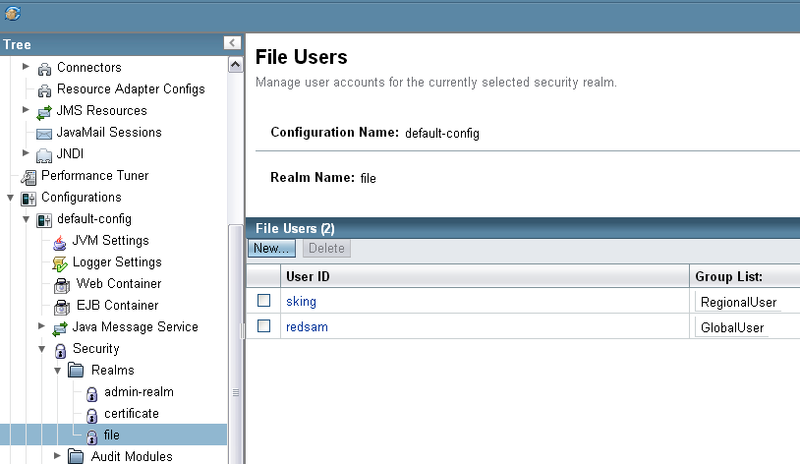 I want to enable those buttons only if the user logged in as Admin in ADF running on Glassfish Open Source edition. I am new to this world. If you can guide me then that will be great. 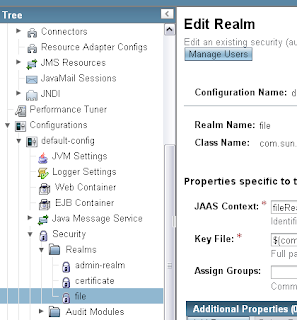 Where should I change security realm from file to jdbcrealm. 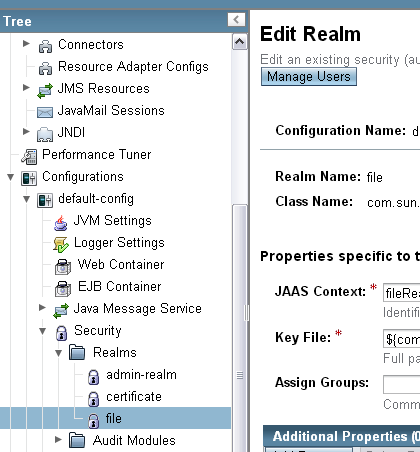 I have already configured it under glassfish server. "The requested URL /files/MultiTaskFlowApp_gfsec.zip was not found on this server"
Yes, I will do it later today. I cant find this sample anymore, sorry. Thanks, this will save me time to allow update for samples older than 2014 year. thanks to Timo now I can analize your example. 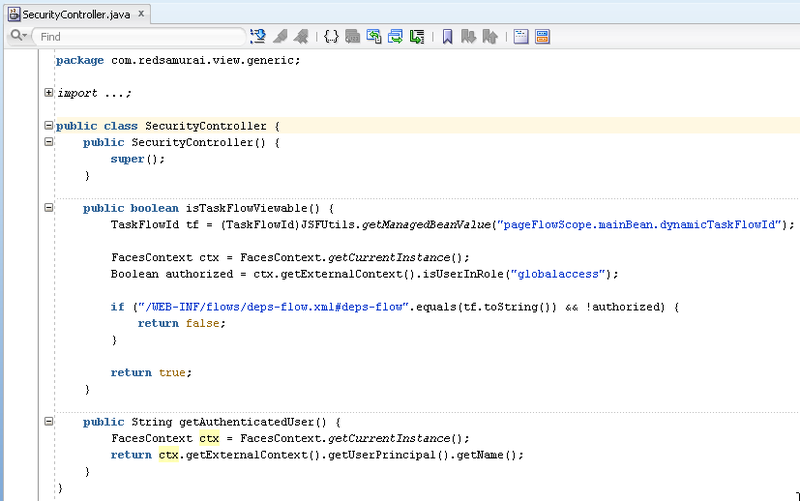 Basically could tou tell me what version of JDeveloper - Glassfish (possibly with the JDK) - ADF Essentials have you used? 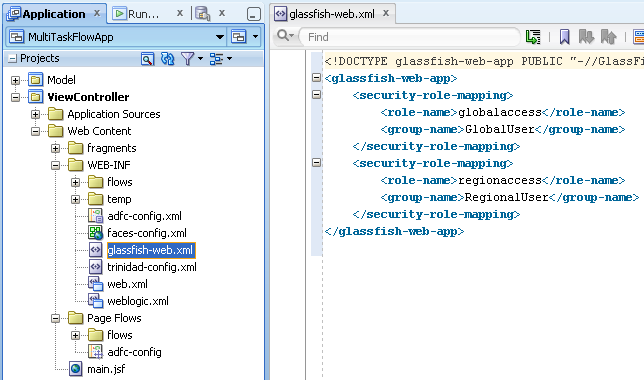 I am very interested in the ADF Securirity on Glassfish. Regularly follow your blog which is an excellent and very useful, but I see that there is no examples, is there a possibility to find them to download them. Recently working mostly on normal ADF, thats why no posts related to ADF Essentials.